Comets: Icy Dirtballs - Solar System Planets And Moons Section. Comets Seem to Be Icy Dirtballs. The traditional view of comets is that they're "dirty snowballs"; mostly water ice, covered by a layer of dust picked up as they travel through the Solar System. But after Deep Impact's collision with Comet Tempel 1, scientists are reversing that description: they're more like "icy dirtballs". When Deep Impact smashed into the comet, it released more dust than water vapour. This means that comets are mostly dust and rocks, held together by a water ice "glue". 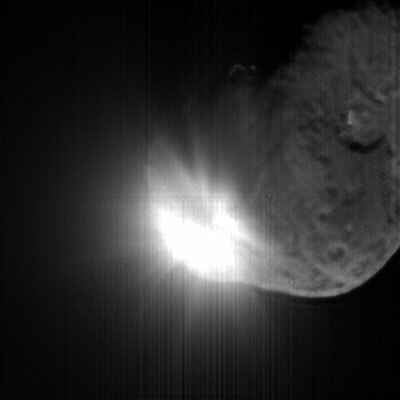 Deep Impact's photo of Comet 9P/Tempel 1 shortly after impact. Image credit: NASA/JPL. Tempel 1's icy nucleus, roughly the size of central Paris, is dynamic and volatile. Possibly the impact would also trigger an outburst of dust and gas, and produce a new active area on the comet's surface.